Recent HESA figures revealing yet another increase in the award of first-class degrees have provoked predictable consternation among commentators. Liz Morrish provides some clarity and insight into why student achievement has risen sharply in recent years. The higher education system, and its culture of metrics and key performance indicators, has constructed a student who is a consumer with anxieties which must be allayed by the provision of roadmaps to success. Sound pedagogy is another key reason for such marked improvement, as are the twin forces of the broadening of the first-class marking range, and regulations for “promotion” to a higher degree classification. “Figures on degree scores from the Higher Education Statistics Agency, analysed by the Press Association, show that 40 higher education institutions saw the proportion of firsts rise by more than 10 percentage points between 2010-11 and 2015-16” (Simon Baker, Times Higher Education, 20 July 2017). Once again the annual HESA figures on degree classifications have set in motion an outpouring of consternation from broadsheets and tabloid newspapers alike. Photos two weeks ago of conventionally attractive, white, and mostly female students tossing their mortarboards are now displaced by sneers and insinuations that their achievements have been compromised by a wanton lowering of standards. Simon Baker’s piece shows some startling figures: the University of Surrey’s proportion of first-class graduates has doubled between 2011 and 2017 from 19.3% to 41.2%, while firsts at the University of East Anglia have tripled from 12.5% to 34%. The article offers some explanations for the large increase: better teaching, higher entry standards to universities, students working harder, the effect of students paying higher fees, league tables which reward high percentages of “good degrees”. This year there is an additional incentive to send students out with a first or upper second-class degree – many employers demand them, and the Teaching Excellence Framework rewards institutions with a solid track record of graduate employment. But for the newspapers, I suppose it is what they call “low-hanging fruit” – something they understand so little about, it is easy to distort the facts and take a whack at universities, ever a target for an eye-bulging populist. You almost expect to see Lord Adonis weighing in. 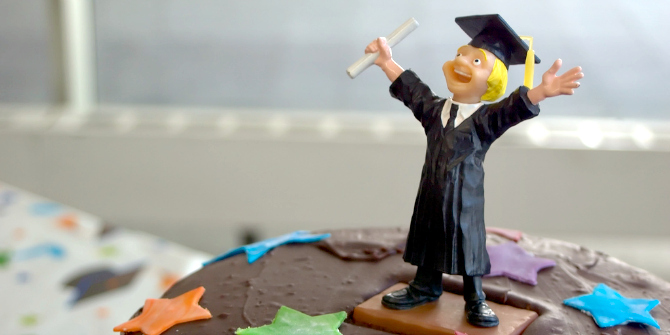 Image credit: Graduate Cake Guy by David Goehring. This work is licensed under a CC BY 2.0 license. I think I can offer some insight into why the achievement of students has risen in the past six or seven years. For over 20 years I was actively involved in quality exercises at subject, departmental, and institutional levels. I also gained considerable experience as an external examiner. Progress in academic standards and quality has been in process throughout my career, and it seemed to me we had achieved peak criterion-referenced scrupulosity. No longer is the award of a first-class degree treated as some kind of mysterious alchemy, recognised only by possessors of an equal or superior first-class mind. The culture of metrics and key performance indicators has made itself known to students in the form of learning outcomes and assessment criteria. This means that students are not in the dark about “what the lecturer wants”, or “what I need to do to get a first”. The approach to advanced learning that elicits such questions is, to my mind, inherently flawed, but nevertheless, that’s where we are in UK universities. The system has constructed a student who is a consumer with anxieties which must be allayed by the provision of roadmaps to success. We have also been led in this direction by very sound pedagogy. We now know that the best way to learn is by having a go, and then getting advice from someone whose knowledge and experience can help you improve. To that end, students are given many forms of feedback during their course, among them formative and summative feedback. An assessment may be broken down into, for example, a proposal which is marked and returned with comments (formative), and then an essay or project which a student can write up in the light of this feedback (summative). Lecturers are also encouraged to make available “exemplars” which show how a previous student has attempted the exercise (anonymised, and with permission, of course). These will be accompanied by a commentary which clarifies exactly how the student has met the marking criteria, and why the grade was achieved. The marking criteria themselves are extremely explicit, and the marker will indicate, for each of the criteria, exactly which level has been achieved. The comments will give guidance on how the student could improve to the next level. This is how quality feedback should work – the student knows exactly where the areas of strength and weakness are, and can work to address them. No surprise then, if more students learn to follow these recommendations in order to achieve higher grades. And for the marker too, there are surprises. Sometimes the mark you originally had in your head after reading an essay will change once you start to systematically align your marks with the criteria. Additionally, for many years external examiners have been encouraging internal markers to extend the range of marks given. It is easy to see how many more students ended up with a 2:2 or a 2:1 when the vast majority of their marks over three years were between 50-69%. If they were awarded a first-class mark, this would probably be between 70-74% so it was unlikely to tilt the average over the first-class threshold. More recently, the top end of the scale has been opened up because, well, not all first-class papers are equally good. So now a student may receive 96% for an exceptional piece which is regarded by markers as almost of publishable standard. This would be very rare. But there can be marks in the 80% range for excellent work, as well as a solid 70+% for the very good pieces. A few of these stellar grades and you will get more clear, numerical firsts emerging. Even in pre-HESA, NSS and TEF days, it was never the case that all firsts were awarded on the basis of reaching the numerical threshold of 70%. This was largely to take into account the rather parsimonious award of marks over 70% for essays and exams, and the artificial compression of those first-class marks into the 70-75% range. Very few candidates would end their studies with an aggregated mark of over 70%, so exam boards would consider a candidate for “promotion” to a higher grade if their score fell within 1-2% of the first-class borderline. Also, scores were weighted to reflect “exit velocity”, so the student who improved over the course of their degree and achieved mostly first-class marks in their final year, would graduate with the higher classification. There were other locally agreed regulations, but as far as I am aware, most universities acted to make sure students were awarded a degree classification which reflected their ability and scholarly improvement. This worked well. The problem, if it is a problem, is that we now have two forces of uplift operating at the same time: the broadening of the first-class marking range, and the regulations for “promotion” to the higher degree classification. If both are applied, it is not surprising that 20-25% of candidates qualify for a first. This would explain the very large increase from 2010/11 to 2016/17. I am not making any recommendations here, merely trying to add some clarity and reason to what has become a rather volatile issue. I have avoided the term “grade inflation” because this oversimplifies the confluence of processes and rationales which have led to the current situation. Universities must prioritise good practice and fairness in teaching, learning, and assessment. But they must also guard against the more perverse incentives presented by consumerism, student satisfaction, league tables, and the TEF. This blog post originally appeared under a different title on the Academic Irregularities blog and is published here with permission.